Often times container gardens are positioned along a walkway or grouped on a patio to liven up the scenery. On first arrival to my front walkway one would notice three 12 inch clay pots and another sitting on a low pedestal just beyond those. Positioned in a straight line they serve as a divide between the concrete walkway leading to the front door and the natural oak leaf-bottomed pathway leading to the back gardens. They are stuffed full of tightly clustered Miss Muffet caladiums with ivy and chartreuse potato vine (both clippings from existing plants)trailing out underneath. Three symmetrical pots are rightly fitted in this case. Same pot. Same planting. Same height. Same distance apart. The growth blends together to "become one" ... at least in your mind's eye. Another common use of container gardens is as bookends to a seating arrangement. Here we moved to the back of the garden., Looking from the side twin containers on either side of a curved cement bench (the bench is barely visible in this photo -I just realized). In this case look-alike containers are necessary for balance. But just so it doesn't come off as too symmetrical I placed them at an angle... different positions from each end of the bench. Side note: The pots we just viewed from the front walkway were here last fall/winter stuffed with red new guinea impatiens. In that situation I had two angled on one side of the bench and one on the other. I like that look for a change up as well. All the fun of containers. They can be moved around. The top view (above) of one of those containers... home to holly fern, coleus, caladiums, & lemon-lime dracaena (oh, and a pass-along lovely lime green & white trailing plant I do not know the name of but it is very hardy anywhere). The containers at Hoe & Shovel are much like the rest of the garden. In that they are put together with the same concepts in mind. 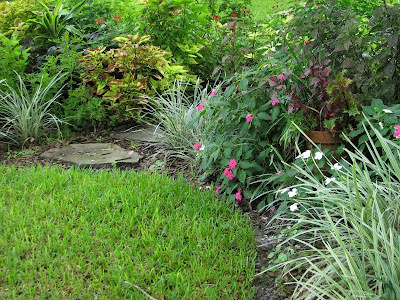 Most of them have one or two foundational plants and then some annuals which can be switched out with the season if necessary. And just like the garden they are tended to and enjoyed all year round. Besides the most common uses for containers, I am particularly fond of placing them directly into the landscaping incorporating the miniature gardens with the existing layout and design. 1) The automatic irrigation helps me to keep them watered during regular rain periods in spring and winter (not summer- they still have to be hand watered). 2) They can be easily moved around as the landscaping/seasons change OR as needed to fill in any vacant or sparse areas. 3) Seeds drop into them from neighboring plants and start all on their own... impatiens are especially famous for this habit. 4) They add a level of height for accent and more dimension in areas where needed or wanted. There are two (above photo) just to the right of the stone pathway and beyond the liriope border plant. The clay pot with pink impatiens spilling over the side is not visible at all but you can see the bottom of the clay pot that is holding self-seeded impatiens, blood leaf, coleus (I just stuck those clippings in there a couple of weeks ago) and dark pink polka dot plant. There is no visible end and beginning many times to the surrounding plants. 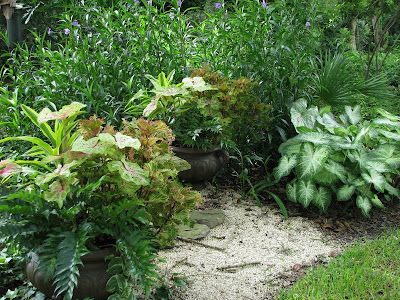 In this case variegated schefflera crowds right next to the pots in the background and more impatiens on either side. Can a Gardener Have Too Many Container Plants? There are four pots in the above photo. If you look first for the change in height it will give you a clue as to where they are located.This flower bed is located just beyond and parallel to the pool/back porch. 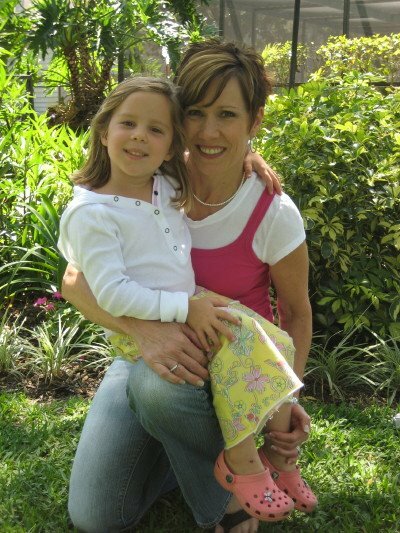 The first pot is bottom left in the photo with the yellow lantana. The lantana has taken over the pot this summer but when I cut it back the xanadu and ivy will be better viewed. There is also some trailing purple queen in it. Now look to the far end and just in front of the iron gates holding back all that mexican petunia. Ha! Very good, you have good eyes! There is a container garden in front of each of the old gate panels which are placed at an angle in the shape of a wide V.
Maybe this marked photo will help if you couldn't spot them at first. In the pot to the right Ti plant stands tallest. Underneath its stripy magenta leaves is a pink impatien (dug out of the ground close by), caladiums (white queen) were popped in when the bulbs were delivered in June, there is a jewel of opar on the side not visible and some trailing ivy. ... a tighter frontal view of the pot sitting amidst the evergreen leathery leaves of lily of the nile covering its base. This pot holds dark angel wing begonia, blood leaf, caladiums and trailing potato plant. The begonia was literally cut from a ground plant and a bare branch of it placed in the soil back in April. The caladiums all returned from last year's arrangement and the blood leaf popped out in the spring ... from a dormant seed I suspect. This container along with many others has to be pruned much like the rest of the garden. 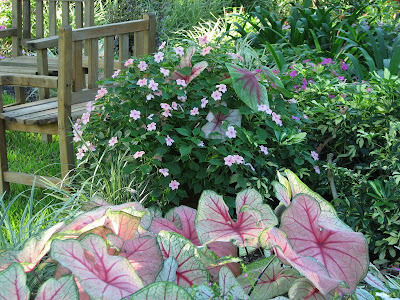 In the above photo, just behind that first chair (the chairs get moved around as well) is a plump, round display of self-seeded impatiens and caladiums from past years staying in the pot. 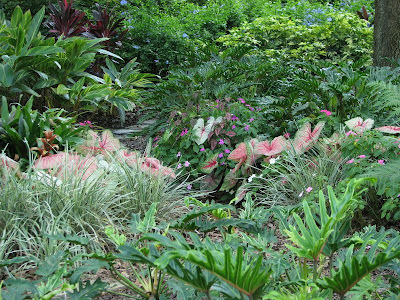 There is a stepping stone walk-through between the caladiums in the forefront of the photo and the schefflera. Simple clay pots are my container of choice for the most part. They stay outside all year. They are well draining. 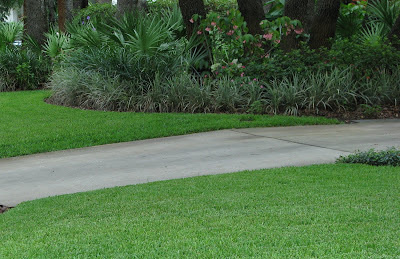 I like the natural way they fit into the landscaping and for the most part you end up not even being able to see them. To another planting bed in the back gardens we go. In the above photo if you look almost directly in the center you will see the container garden. It sits to the right of the flagstone pathway and in front of a couple of boulders of limestone. Same photo to help the eyes see its location. 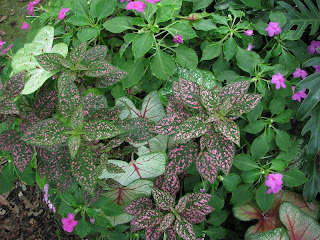 A bird's eye view from the top reveals the self-seeded impatiens, pink polka dot plant, white queen and miss muffet caladiums all competing to be the center of attention. Lastly, we go back around to the front and to the left of the driveway placed just inside the first planting bed is a potted container with angel wing hardy begonias of amazon size. 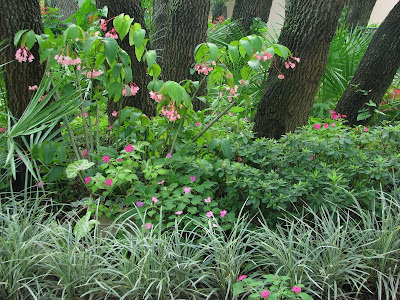 Looking a little closer will reveal the 5 foot stalks of hardy begonia tucked in between azaleas and palmettos just behind the liriope border. 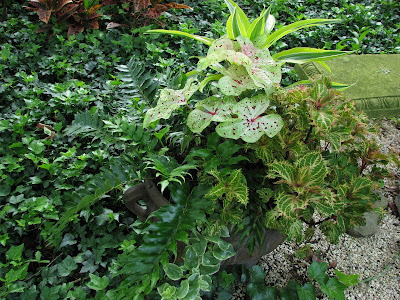 At the base and tumbling over the sides of the container ... caladiums, spathiphylum , impatiens and trailing variegated ivy. There are many more hardy begonia throughout the garden. All started from one bare branch given to me by a neighbor. There is another post forthcoming featuring those. Thanks for hanging in there for this long post. I didn't show you all the containers because I talk too much. I've got more to share in another post... maybe I should just put the pictures up and be quiet. It's so beautiful!! So lush and perfect. I've shown a few of the photos to my coworkers and we're all in agreement, MAGAZINE. I'm so blessed to have a professional designer as my mentor!! We'll need to spend a football weekend touring the nurseries soon. meems, hello and good morning. I've just been walking through your beautiful garden, cup of coffee in hand. You've shown me how important container plants can be to a design. As I was 'walking around with you' I finally got it; I can have plants that aren't happy in my soil conditions! I can put them in containers and they will give me the color, height and texture that the garden is needing! Thank you....some of us are slow learners! Your garden is so beautiful and I love how you blended the containers in with the landscape. It is very difficult to spot them. I've done that to fill in bare spots in the garden, especially in areas where you can't plant due to tree roots or there is one area where a huge chunk of concrete is buried so I put a large container there. As usual great post! Meems, thank you for showing your pots and how you use them. You and your garden are inspirational. you have shown me more than anyone how I want my garden to look, mainly different plants of course. I will come back to this post for a better read when I have more time. Most of my garden is open plan, at the front and side and I hesitate to use containers there but 'free' plants and plastic pots wouldn't matter if they went missing. I am dreaming of next year already but first I have to find a plant to edge the borders, liriope would be nice, but it will take longer to bulk up here I think. Hope you don't mind. I have way too many containers on my deck and my front flowerbeds look pitiful. I am going to move some of them to the front. Thanks for the great idea. elieg: Hey thanks for popping in! Doesn't professional mean you get paid? Somehow that is a missing element around here. :-) You are doing quite a wonderful job with your garden all on your own. You are gifted at it and it shows up in your own design. YES... touring nurseries ... soon! gail: good morning (actually afternoon now) to you with my coffee in hand. Great idea! You CAN grow some of your favorites in containers with purchased soil. Wish I had thought of it. Thanks for the garden walk around... I needed some company. perennial gardener: thank you! I have to say I don't have the huge pieces of concrete issue but roots are a problem with all the oaks. I have a couple of pots in the front garden at the base of the oaks for that very reason. I've learned to plant pieces of transplants (or cuttings) where there are lots of tree roots. If I can wiggle my spade down between some tree roots enough to get the roots of the transplant into the soil they will survive and flourish. Much to hard to dig out enough ground for even a 1gal purchased plant. Sylvia: It IS a long read... sigh. So happy to inspire and I so wish you had a blog ... maybe some day? I have found that a border not only tidy's everything up but no matter what you have planted it pulls it all together and makes it look more complete IMO. Liriope works well for me because, like I've said in the past, I don't have to buy it anymore -- just separate what I already have and the border is easy to create. I am thinking of next year too... well actually I'm thinking of autumn. I'm working on getting my veggie garden prepared for planting in September. Thanks for coming by, Sylvia, always a pleasure. 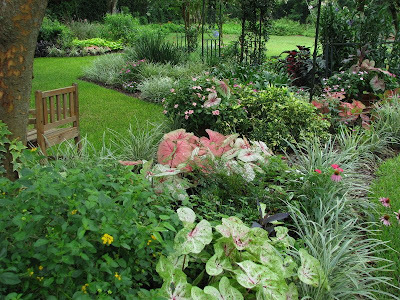 deb: Perfect.Too many container plants on a deck or patio can easily look cluttered. The container pots I've put in the landscaping seem to do better in the more natural environment too. That might be my imagination but I think the decking (mine anyway) around the pool is hotter because of the heat absorbing in the surface and the reflections from the pool... much different than the natural-ness of the ground. Just my theory... it could be all wrong. s/s/m: Was that you, Silly? Or were you Serious? Too funny you are!!! Should have called you first. Excellent post! I've tried to explain how using pots in a border can help mask where there are holes, but your post makes it so clear. Your use of containers is great. Even though I know these things, I keep kicking myself at this time of year that I didn't make enough containers to stuff into the garden now. great post! so nice to walk around the garden with you and the pots. they truly are amazing. i still don't always have success with the whole container thing (they need a lot of attention paid and i forget about them). my petunias in chocolate pots are going into the compost this week. they look pitiful. they probably will thrive back there. haha! i agree with elieg, southern living would love to get a call from you! MMD: Containers are great at masking holes and weak areas- that's a really good description. Is it too late to go to the trouble of putting some together? I actually bought a new pot today for some cuttings I've been nurturing ... I'm not telling anyone around here though... they'd think I was crazy. Marmee: Containers do take extra care. They demand more water than plants in the ground and I can see why it would be easy to forget about them. I get into trouble when I leave town. Then I gather them up together so my neighbor (who is kind enough to water for me) doesn't have to traipse all over the yard to find them. Gardening has its requirements! Oh my yes!, I use containers everywhere and move them on a whim. I guess next year I'll have pots full of caladiums thanks to you. I'm almost ready to put in the sweet faces of the pansies again. It's probabl going to go from hot to cold here in one day. Oh Meems! What wonderful gardens you have. I love all the containers and the fact you really can't see them. You really have a green thumb-sticking pieces into the ground and they grow?! I am so envious of that dark dragon wing begonia. I have 2 this year, but both have the green leaves. I didn't see any like yours. 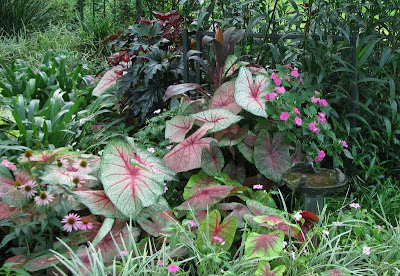 And of course you have us all enthralled with caladiums now. Absolutely going to plant more of those next year. Thanks for a wonderful post! Hi Meems, your garden is breathtakingly beautiful and I love the landscaping! You have very nicely blended your containers with your garden. Meems, I wasn't complaining about the long post, quite the opposite. You manage to keep our interest with great tips and lovely photos (just what I look for in a gardening book!). Look forward to the other posts you mentioned here. Gorgeous as always Meems! I love how your containers so often blend right in. I agree with the others, and Elieg said it succinctly: "MAGAZINE." You know I'm already crazy for caladiums - thanks for showing so many ways to design with them! I can relate to the need for small transplants due to the tree roots - I have the same issue here. And of course, I can relate to long posts ;o. I love posts like this - I learn alot. And during those times when time is short, just looking at the photos is a feast for the eyes. I can always come back later, and do. Wonderful use of container planting. It really does add visual appeal. I was wondering if you could share your potting soil secrets. You seem to have the magic formula. My container plantings rarely do very well. anna: Pansies already? Oh they would surely perish here. 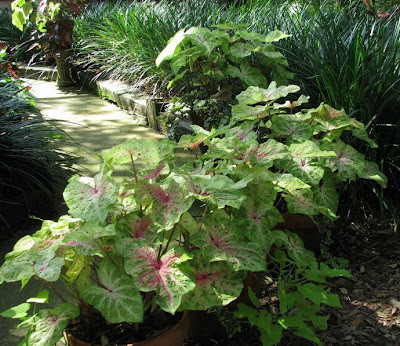 I can't wait to see your caladium pots next year! beckie: thank you. Sometimes when I "stick" things in the ground they don't make it. It doesn't really have much to do with me. I contribute it more to the climate and soil. I am learning which plants I can do that with and which ones take more care. I'm really too lazy to go to much more requirement than the 'cut and stick method' though. 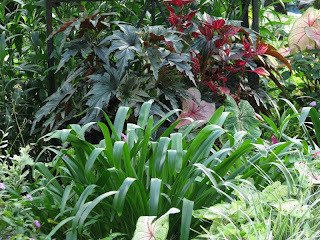 I am so in love with the begonias--- both the dark leaved and light (I have a post almost ready dedicated just to them). Green Thumb: Thanks for stopping by and thanks for your lovely compliments. I took a peek at your ornamental peppers and they are quite nice... so colorful. Sylvia: Oh, no problem, I never thought you were complaining. I am a confessed talker! 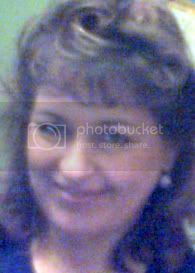 Garden Girl: All this talk of magazines makes me wonder if one would be as kind to me as I am to myself... only publishing the most attractive views??? The containers are a creative outlet for me and I enjoy the challenge of putting plants together then doing what it takes to make them grow. That part is more fun than it is work. I guess that's why I keep adding to my fun! (Some of the pots in this post started back then with that mixture.) What I buy now is a specially mixed concoction from a local garden center so that isn't going to help you either. :-( I can tell you it has lots of crushed bark in it and not as much dirt... so sorry... I don't have a great answer for you. Meems, Great post. I loved going around with you to view your garden. So lovely--pic book quality. I am envious of your garden & how it looks. I wish mine looked half as good. I agree containers do help the looks of the garden to get heights & color. I am learning that some of my plants are not doing so good in pots so will have to put them in ground. I have a few plants that have blue blooms & I would like to make a blue garden--question for me is where. It will have to be in back yard somewhere & I have a huge oak tree that shades most of the yard most of the day. Oh well back to the drawing board. BTW, What kind of grass do you have? This is a wonderful post on containers, Meems! Everything just looks perfect. I love your use of caladiums. I have always loved them and I plant them every year. Here, we have to lift them in the fall, but they're worth it! Great post! You have given us great principles we can use in our own gardens while delighting our eyes with photos of your beautiful gardens. What a great way to start a morning. susiesq: Thank you. I'm just learning about butterflies enough to even be able to name them occasionally. I bought a great book on Florida Butterflies that helps a lot. lola: Just be encouraged by how long I've been gardening in the same place. It has taken me years to learn what works well here and pretty much that's what I stick to. My grass is St. Augustine and it isn't liking all the rain we've had. But I'm not complaining... most everything else is happy with it. Laurie: Welcome! Containers make gardening flexible and work FOR us in so many advantageous ways. 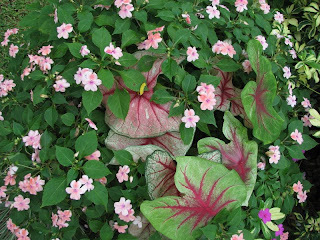 Kylee: So glad to hear someone from north of here enjoys caladiums and is happy using them. I'm certain if I had to dig mine up each year they wouldn't be a staple in my garden. Kim: Thanks for starting your morning with me. I'm happy you liked the photos.